People change distros all the time. Granted, some of them leave OpenSUSE routinely, but there are stories that stand out, such as this one. What also worries me, is openSUSEs close link to Novell. The integration of zmd is such an example. 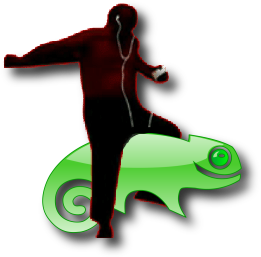 That’s another loss for SUSE, which made friends with the wrong people (that’s Steve Ballmer riding the chameleon on the left). While we’re at Novell bashing, we might as well add these SUSE security advisory and point out that Novell’s client has a privilege escalation vulnerability. A vulnerability has been reported in Novell Client, which can be exploited by malicious, local users to gain escalated privileges. Quick Mention: Who Needs Linspire When You Have a ‘Community Distro’? Boy! You don’t even read the stories you link here. Your blog stinks like a three-week-old herring. And why is that iPod-user riding the chamaeleon? Does that point to the good iPod-support in openSUSE’s Banshee music player? eet, did YOU read the article? The point you mention is initially discussed wrt upgrading. The user understands that it is removed in 10.3, but is unsatisfied with the way SuSE upgrades. The user likes the rolling release system in Kubuntu. Note that I, myself, do not like rolling releases in general (ie; outside of Etch), as I find them much more of a hassle than regular clean installs, but this user feels differently. Next, the user mentions it in regards to SuSE’s relationship with Microsoft. The user doesn’t feel that it would ever have been included to begin with were it not for that relationship. Wether that is true or not is open to speculation, but that is something you should take up with the author, not this site, as this site reported on the contents of the article accurately. Taking security updates as argument against a distribution? And I thought this site can’t become even more silly. I doubt “making friends with the wrong people” themselves is a reason to boycott novell. Rather, the reason to boycott Novell is that the MS-Novell agreement’s patent deal could be used to make Linux non-free software. That’s correct, Yuhong. This isn’t an idealogical criticism against Microsoft, but a case of seeing 2 companies which use FUD to distinguish themselves and put at great things anything which is Free (as in freedom). That’s just the gist of it, without going into specifics. This site, as the other posters above point out, is nonsense, and a rather sad attempt by an individual with apparently zero experience or understanding of running a large corporate to spread his own FUD. There have been over 2 million downloads from Novell of Suse Linux which people all over the world are using for free. Linux is free, and will always be free. I have to make one point first: Leaving all other issues out, from a pure user’s standpoint, OpenSuSE 10.3 is, IMO, the best distro on the planet. And it’s not even a close race. And that’s what makes it all so bloody sad. That’s what irks some enough to make a website about it all. However, burying your head in the sand and pretending these issues wrt the MS/Novell deal, patent trolls, OOXML, etc… won’t make them irrelevant, unharmful, or make them go away. These are all good things to be aware of. This is the number one FUD-site in the world! Yay, now I know what your aim really was, FUDmeister Schestowitz; you wanted to break a world record! As others already mentioned above, you’ve misinterpreted my article. My article is about describing Kubuntu from a SuSE Users view and to compare them both. And soon I’ll release the next article and you’ll see that I do not see just positive things about Ubuntu. SuSE is still a good distribution. And *if* I’ll ditch SuSE in favour of Kubuntu that is in no way related to any religious view cause of the misinterpreted political relation to Microsoft. SUSE (OpenSUSE) is a good distribution indeed. I look forward to your next article. And the religious view is based on a politically misinterpreted relation indeed.